Attention all DJs! The competition is now over and the winner is Technical DMXP6 Double CD Mixer with USB, Scratch and BPM! Built with the same quality design and forward thinking technology that we can expect from this team this mixer goes above and beyond, providing the DJ with every tool needed to keep your crowd dancing and partying. 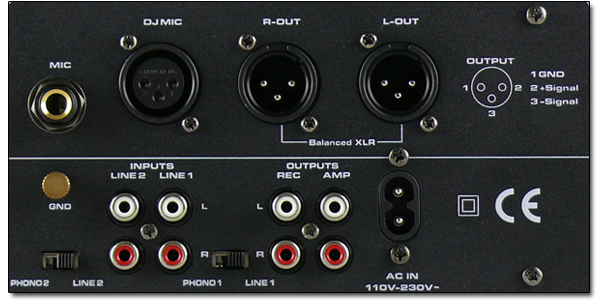 Connect this mixer to your set up from the back panel using the balanced XLR, RCA master out and RCA record out outputs. Utilize the rack mountable design and easily integrate this into your mobile rig or DJ coffin. Connect 2 USB flash drives to play music files or load 2 different CDs into the front loading CD decks. Use the folder browsing feature to search through your USB flash drives. Play MP3 Cds in addition to a standard audio CD! Connect a microphone and have the ability to talk to your crowd while mixing! Built for the seasoned professional DJ and for the DJ that is just starting out, the DMXP6 has all the features you will ever need! Make a loop on the fly, use the rubberized jog wheel to precisely cue your tracks, EQ your songs using the bass, mid and treble tone controls per each channel, use the reverse playback for both CD and USB tracks and get that “vinyl” feel, pitch your music up or down and match your beats using the seamless pitch control or use the BPM counter to make it easier to match up your BPM’s! If you are Dj’ing for a dancefloor and the party people are moving and grooving, the biggest mistake a DJ can make is not blending the next song on time. If there is a pause or a change in the groove, you will lose your entire dancefloor. Use the BPM counter and insure you will never embarrass yourself by blending a mix that is off beat! Use the built-in scratch function for both the USB and CD inputs and add some flare to your mix while impressing the crowd with your DJ skills! These are the tools that separate the person that just “plays” music from the DJs come to rock the house! Aligned with Technical Pro’s rugged design and long lasting build for all their gear, the DMXP6 has a built-in anti shock system the helps prevent any skipping or playback issues. The sound output utilizes an analog to digital converter at 24 bits with 8 times oversampling which means this bad boy will sound thick and full, lighting up any room with that “Big Room” club sound DJs strive to achieve! 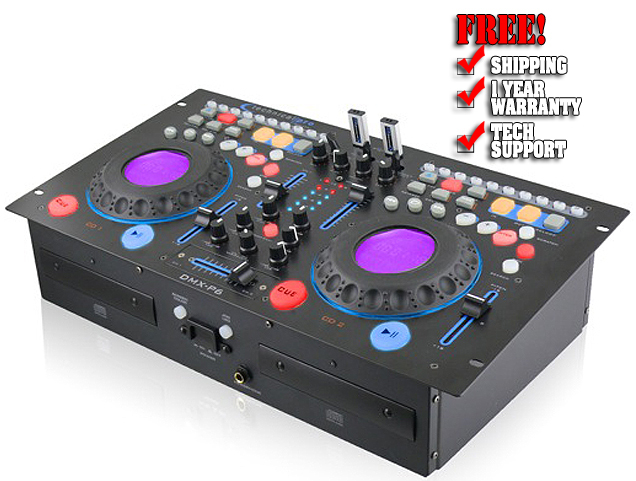 If you are a DJ and need a reliable, quality built mixer that can do it all, this is for you! As a professional DJ, the party’s entire mood is controlled by the touch of your fingers. One thing is certain when a DJ is working there is just one thing in your world and that is the music. You create a world of blend and balance between beats that magically send the floor into a rave. Ask almost any DJ how he manages to create such fantastic sounds they will point to two factors their gear & skill. With the Technical Pro DMXP6 you get the power needed to create those moods. Technical Pro’s mixers have a reputation for providing high quality audio and reliability, giving professional DJs the tools they need to expand their musical horizon, with capabilities for mixing, remixing, producing and performing. Incorporating features recommended by many professional DJs and club engineers, they raise the bar on flexibility and performance. The DMXP6 is the “go-to” mixer for DJs the world over, novices and professionals alike. This dual CD mixer offers all the most sophisticated features that allow you to mix, remix, produce, and perform like a professional DJ, at a price anyone can afford and at only 15 light, portable pounds. Don’t confine your musical creativity to rigid presets and outdated features. The DMXP6 offers clean, intuitive controls, and simple, yet dynamic construction. If high quality audio, reliability, and a professional sound are important to you, choose the DMXP6 for the best in flexibility and performance. DMXP6’s USB inputs will accept USB flash drives up to 8GB provide quick and easy access to your .mp3 file play lists. DMXP6’s buffered skip-protection technology keeps your music playing, even when vibrations might cause other players to skip. DMXP6's allows you to play MP3 CDs and you can also take advantage of the DMXP6’s ability to browse through folders on your USB flash drive devices. Folder support allows you to browse through your music and select tracks from different folders. Standard cue, search, and pitch controls, and tone controls (bass, mid, treble and gain) allow you to be the ultimate “mix master” of your music. The DMXP6’s rubberized jog wheels allow for easy control; you can reverse, playback, play backwards (reverse), and scratch on both USB and CD tracks. When you match beats from the left to right, from one song to another, the DMXP6 sets everything up. When you start playing both songs, the DMXP6 will display will indicate the BPM for both songs, allowing to to match the beats from each song and cleanly transition from one song to the other.